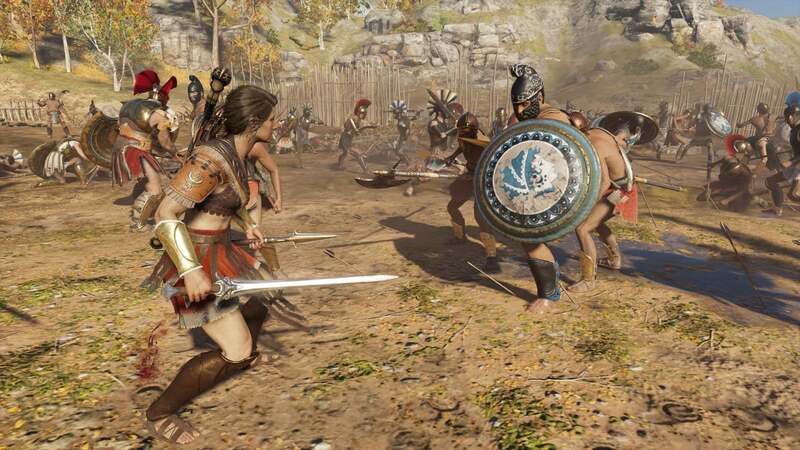 Assassin’s Creed Odyssey lets you play as either Alexios or Kassandra. This can seem like a big choice but it only minimally affects the game. Play as whoever you like. 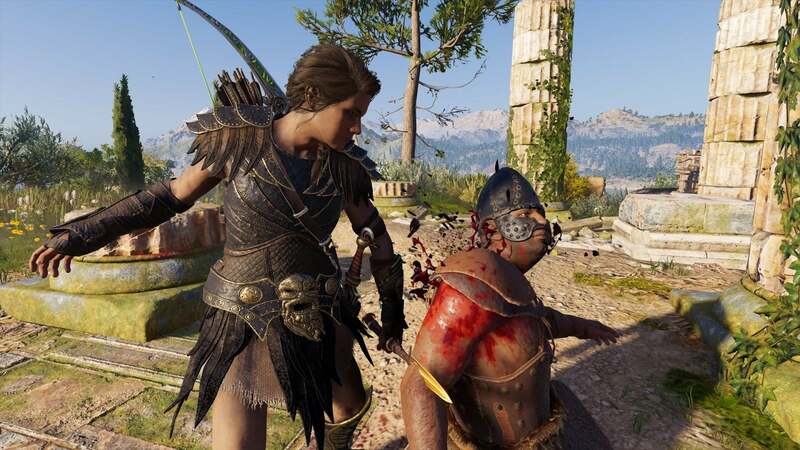 I prefer Kassandra, since I think her voice actress is better, but it’s really up to you. While Odyssey does connect to the rest of the series, it’s so far back on the timeline that it might as well be its own game. If you didn’t play Origins or are just rusty on the franchise’s massive meta-story, don’t sweat it. All you need to know about the game’s modern day protagonist Layla Hassan is that, through the events of last year’s Assassin’s Creed Origins, she’s sided with the modern-day Assassins against their Templar enemies and the Templar backed corporation Abstergo. 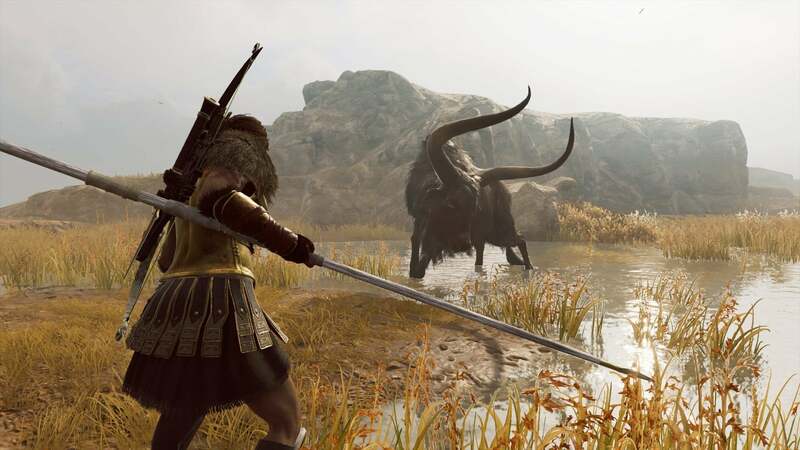 There’s two ways to play Assassin’s Creed Odyssey: guided mode and exploration mode. The former will show you exactly where you objective are but the latter simply gives some hints. Exploration mode encourages you to look at your map and listen more closely to NPCs, for a slightly more immersive experience. It can be tricky to choose a difficulty for a game this big. I suggest starting on the default of normal and then playing through Kephallonia. If that seemed too easy, bump it up to hard. Quests and enemies will scale up to your level or close to it regardless. If you’re playing on normal, they will eventually lag behind your character level in easier areas. Whenever you’re in a new location, make sure to talk to everyone you meet. 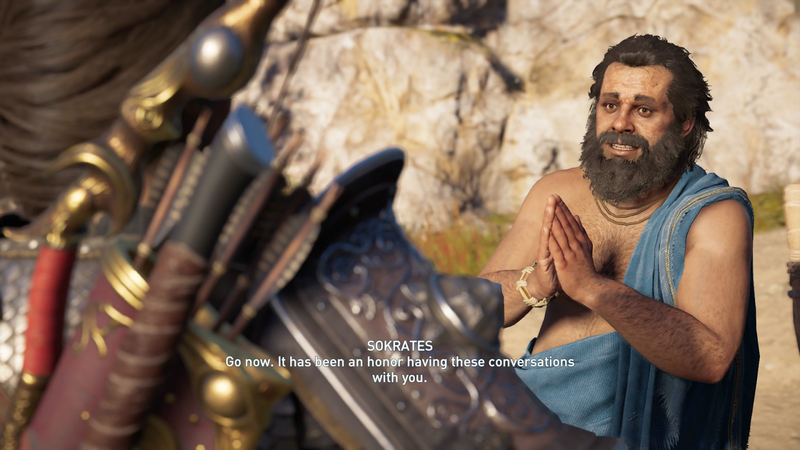 Side questing is a big deal in Assassin’s Creed Odyssey; it’s essential to levelling up and it’s also where some of the best content is. Take your time, chat it up, and do side quests. This is a big game and there’s no need to rush. If you want to progress the main story, focus on Odyssey quests. These will tell the story of Kassandra and her family, and bring you into contact with the other major quest branches: the First Civilisation questline and the Cult of Kosmos questline. Whenever you want to progress, focus on your next Odyssey quest. Odyssey is big and that means you might run into some glitches. I had a big one that nearly messed up my entire save. While the game does auto-save frequently, make some back up saves just in case you run into trouble. Sync points don’t just give you a gorgeous view of the region; they also act as your fast travel locations. Climb to the top of each new sync point you come across, just in case you find yourself halfway across the world later in the game but need to head back to old locations. Odyssey liberally hands out gear as you explore and defeat enemies. If you have obsolete stuff, break it down for part by selecting it in your menu and choosing “dismantle.” The materials you get can be used to upgrade your favourite weapons and, eventually, your ship. If you need extra cash, you can sell gear to merchants, but having materials is more important by far. Once you’re able to sneak into forts and burn supplies, make sure you loot some of them first. It’s another easy way to get extra materials that you’ll waste if you burn everything and run. If you enter your inventory and hover over your quiver, you’ll get the option to craft arrows. They cost one piece of wood, although special arrows require unique materials. Keep your arrows topped off at all times. Headshots are extremely powerful, especially once you learn how to craft special arrows like the extra strong Death Arrows. When you enter a camp or cave, you’re told how many treasure chest or enemies there are to collect/kill. This isn’t just to let you know how much stuff there is; if you complete the checklist, you will get extra experience. If you’re in a location, take the extra minute or two to finish it. 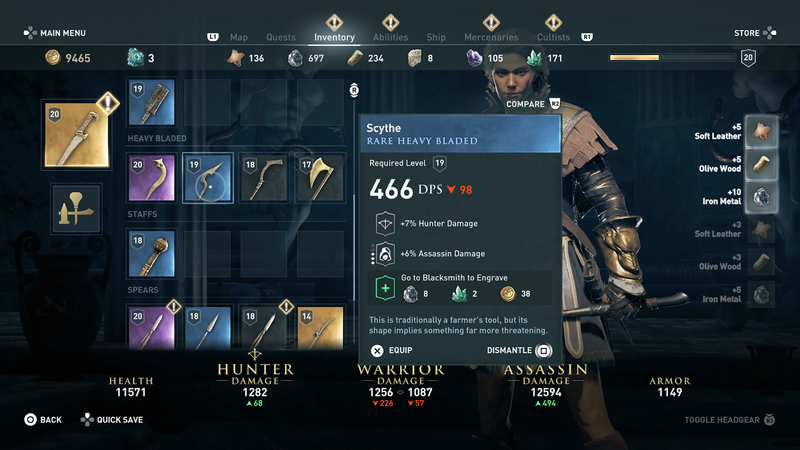 There’s a lot of weapon types in Odyssey but a good spear it worth its weight in drachmae. The extra reach keeps you away from dangerous blows, and their sweepy attacks helps manage crowds. It’s always worth having one on hand for tough fights. Eventually, you’ll start gaining notoriety and crossing paths with bounty hunters. They’re difficult, but you should be fighting them instead of taking the option to pay off bounties via the in-game map. Mercenaries are a good source of quality gear that can keep you well-equipped for most of the game. 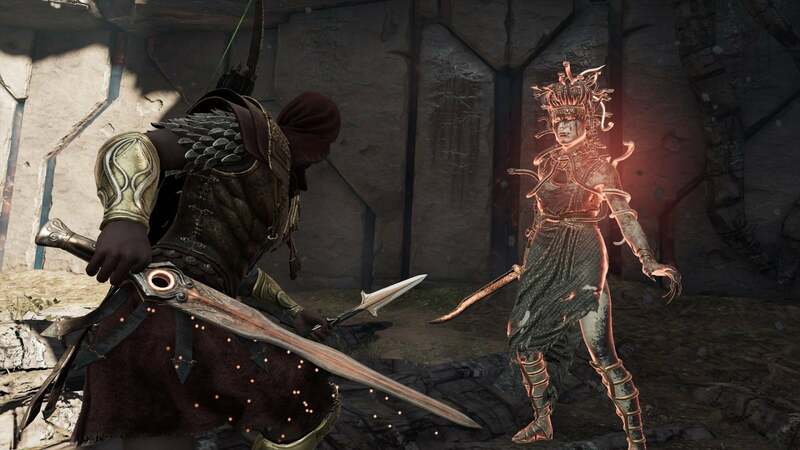 Rush Assassination is an Assassin tree skill that grants the ability to throw the Spear of Leonidas at unaware enemies and almost always kill them instantly. At high levels, you can chain it from target to target. It’s great for clearing out forts and should be one of your bread and butter stealth skills. If you’re fighting someone near a ledge, use Bull Rush or Spartan Kick to send them flying off for an easy kill. In ship battles, this is a great way to instantly eliminate dangerous foes once you board. Just kick them into the water! Once you get your ship, the Adrestia, you’ll want to upgrade the hull ASAP. It doesn’t just keep you alive longer; it lets you assign more stat-boosting lieutenants to your ship. 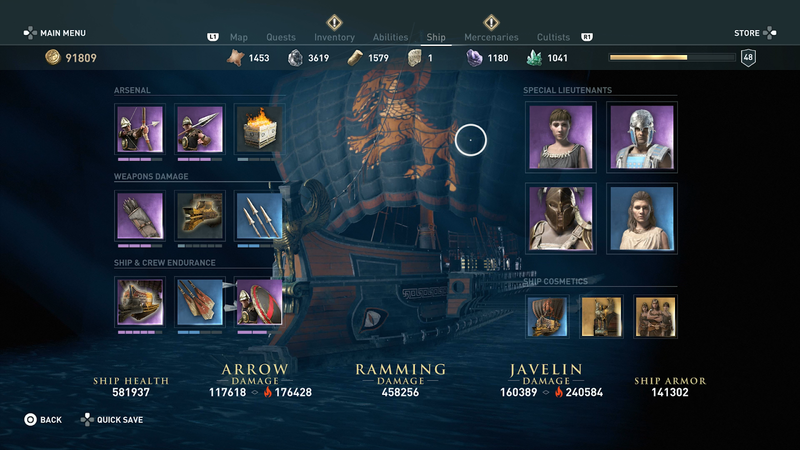 After that, focus on upgrading javelins and getting fire arrows for a much easier time at sea. Sometimes you’ll run into groups of pirates or other enemies on the high seas. If you’re getting overwhelmed, target their smallest ship first and then board it. Each successful boarding restores some of the Adrestia’s health. As you fight other ships, you’ll often see part of their hulls glow. That’s not a glitch. That’s a weak point. Ram it. Shoot at it. It’ll help a lot. Alexios and Kassandra can both romance the same characters, and even if you fail hooking up with your special so-and so, you often have chances to meet them again. Romance is a worthwhile pursuit though; you can gain special ship lieutenants and other rewards. Eventually, you’ll get the chance to participate in regional battles and fight for either Sparta or Athens. Regional take-overs and Conquest Battles are mostly a loot-granting treadmill and not really a story changing meta-system, so don’t stress too much about which side you pick. You can play Odyssey’s big crowd battles like you’re playing a Dynasty Warriors game, but you won’t necessarily win. The goal of any Conquest Battle is to deplete the meter that shows the enemy force’s strength before your side’s meter is gone. Killing any enemies chips at the meter, but you’ll make a bigger dent if you pay attention to prompts directing you to focus on certain enemy captains and the like. Follow those orders and win. Once you encounter the Cult of Kosmos, it’s tempting to want to hunt them all down right away. Instead, spread it out over your playthrough. Many cultists only reveal themselves in side-quests or activities like the Arena. If a clue says “help people nearby,” that means you should be doing side-quests in the area if you want to find the cultist. Halfway through the game, you’ll be given the task of finding First Civilisation artefacts. This questline ties heavily into the real world meta-story, features the game’s best boss battles, and is essential if you want to learn more about your character’s fate. You should absolutely pursue these quests. Odyssey is a big and beautiful game. Soak in the world and sights. Don’t rush your journey and don’t worry if you make mistakes. This is a fun game and you’re a pretty cool person. You’re gonna do great!